MENTOR, Ohio--(BUSINESS WIRE)--Avery Dennison is moving the trade show to the World Wide Web. 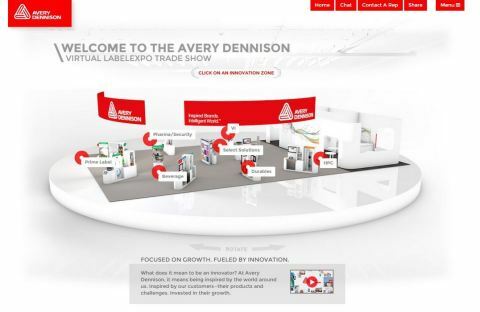 Avery Dennison Label and Packaging Materials will introduce an interactive virtual trade show booth at virtuallabelexpo.averydennison.com to highlight the innovations it is launching at the same time in its booth at Labelexpo Americas. The labeling industry’s premier trade show runs Sept. 9-11 at the Donald E. Stephens Convention Center in Rosemont, Illinois. Using CAD drawings of the physical booth, the virtual booth replicates what will be seen at Labelexpo, including seven innovation zones that feature technology designed for unique segments and applications. Visitors can click on each innovation zone to access product overviews and educational information, including white-papers, videos, and product portfolios. The virtual tradeshow will have a live chat function that is staffed globally by Avery Dennison product specialists following Labelexpo from September 16-17. After that time, virtual booth visitors will be able to submit questions directly to sales representatives and technical experts and quickly receive the information they need. Avery Dennison (NYSE:AVY) is a global leader in labeling and packaging materials and solutions. The company’s applications and technologies are an integral part of products used in every major market and industry. With operations in more than 50 countries and more than 26,000 employees worldwide, Avery Dennison serves customers with insights and innovations that help make brands more inspiring and the world more intelligent. Headquartered in Glendale, California, the company reported sales from continuing operations of $6 billion in 2012. Learn more at www.averydennison.com. Editor’s note: Expert interviews, product samples and photography are available upon request. ©2014 Avery Dennison Corporation. All rights reserved. Avery Dennison, Fasson and all other Avery Dennison brands, product names, codes and service program terms are trademarks of Avery Dennison Corporation. All other brands and product names are trademarks of their respective owners. Avery Dennison's virtual trade show will give access to the company's annual showcase of its labeling innovations to people around the world.